Over the past ten years, Rockland High School has been quite successful when it comes to student participation and recognition in the annual nationwide Poetry Out Loud competition. Poetry Out Loud gives high school students the opportunity to perform poems of their choice at the school, regional, state, and national levels. Since its start in 2006, RHS has had students participate in POL every year. This year RHS received a certificate for being the only 10-year school in its semi-region. Not only has RHS participated all ten years, but the school has also had many winners at various levels of the competition. 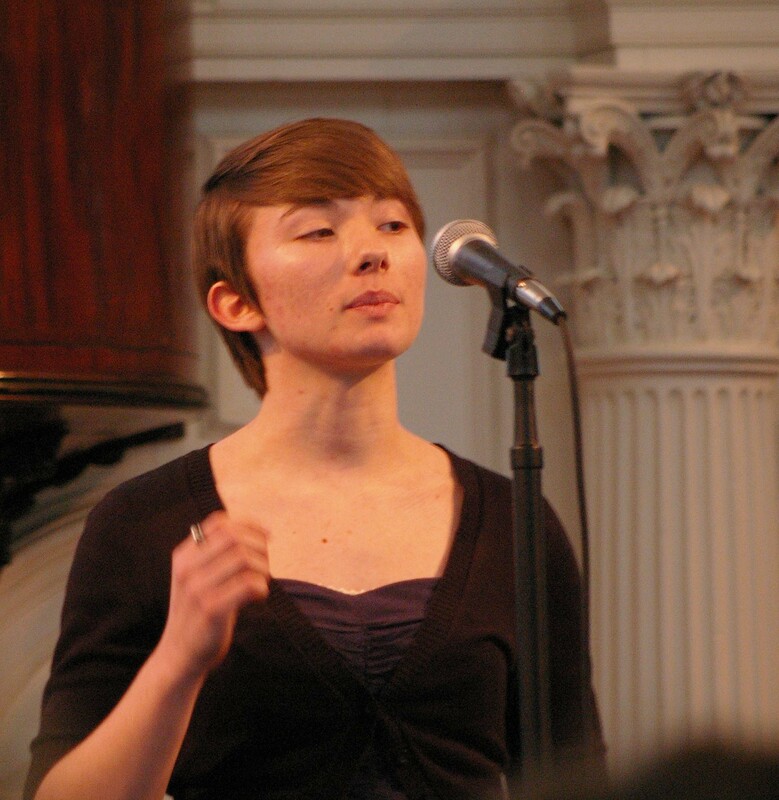 Gabrielle Guarracino, served as one of the judges at Poetry Out Loud State Finals Sunday. Here she advises the contestants to keep their love and study of the arts strong no matter how impractical others label them. Former RHS student, Gabrielle Guarracino was the Massachusetts State Champion for both 2006 and 2007, the first two years of the competition’s existence. 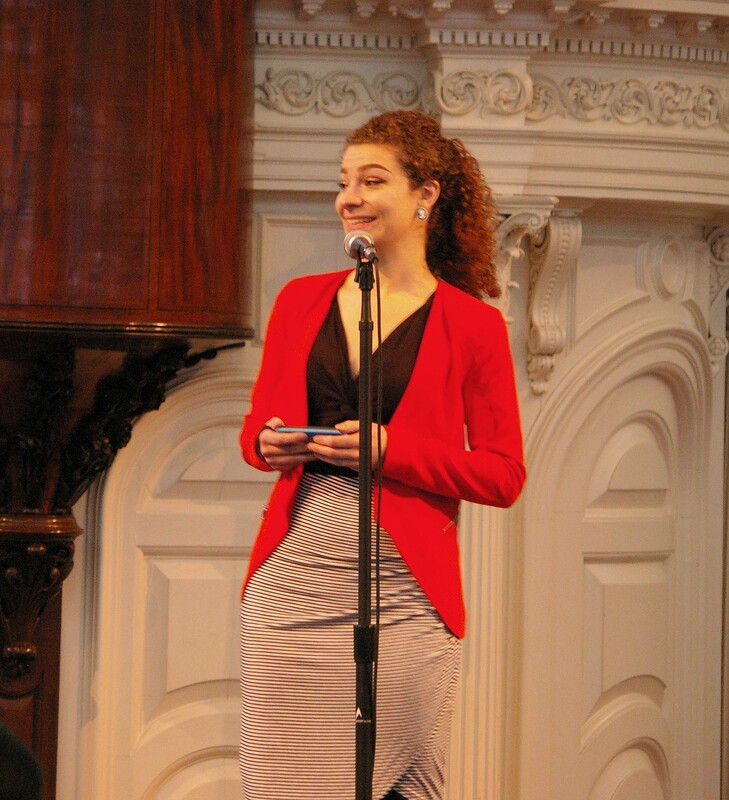 This year Guarracino served as both a judge and entertainment at the Poetry Out Loud Massachusetts State Finals in Boston on Sunday, March 8. Since 2006, Talita Lopes, Ellie Gladstone, Shannon Doyle, Andrew Houldcroft, Chris Carchedi, and Danielle Hill have won first place at the school level. Out of the ten years of POL, RHS has been represented in the state finals eight times. RHS senior Danielle Hill performs her first poem at the Poetry Out Loud State Finals. RHS’s most recent Poetry Out Loud success story, senior Danielle Hill has carried on the school’s Poetry Out Loud legacy competing in regionals and states both this year and last year. How is the Poetry Out Loud experience for students? Hill cites memorizing the words of her poems and being able to recall them on stage as one of the more challenging aspects of competing. Her favorite part is listening to others and seeing what they chose to recite. “I like hearing what other people brought to the table,” says Hill. Other than great experiences Hill has also learned some valuable lessons from POL including being okay with the way her performance turns out no matter what, as well as the concept of dedication. “There’s a lot of words to continuously remind yourself about over the course of the months,” she says. Hill’s success has added to Rockland’s fabulous reputation in the Poetry Out Loud competition state-wide. Although it is students who perform in Poetry Out Loud, Rockland’s achievements would not have been possible without the assistance and leadership of RHS English teacher, Amy Woodward. “I was adviser to the Poetry Club when the invitation to participate first came. I thought it would be something fun for the club members to do,” says Mrs. Woodward of the beginnings of RHS’s POL accomplishments. Since then, Guarracino has served as a model for students participating in the competition.“I was, at first, pretty astonished to see how good Gabi was at this — what a great stage presence she had, and how naturally and intelligently she could communicate the essence of a poem. Then it just became pure pleasure to see her every time she performed,” says Mrs. Woodward. Hill credits Woodward with being the reason for her interest in POL. “She [Mrs. Woodward] was the person that came to me and told me that I had to do Poetry Out Loud. I had never even really thought about doing Poetry Out Loud but she talked to me about it and really inspired me to get into it,” says Hill. Rockland High School’s involvement in Poetry Out Loud started out as something new and exciting for members of the Poetry Club; over the course of the competition’s 10 years it has blossomed into something that students look forward to each year.